Vladimir State University is located in the ancient Russian city of Vladimir, which is 180 km from Moscow. The city of Vladimir played an important role in the history of Russia and was one of its first capitals. Nowadays Vladimir, being a part of the famous Golden Ring of Russia, represents a big administrative, industrial, cultural and tourist center. Founded in 1958, Vladimir State University has become a large scientific-educational institution in the center of Russia. It has highly qualified staff, considerable scientific and methodological potential, advanced laboratory and informational structure, all necessary conditions to organize teaching and educational process and scientific research. The University is equipped with modern electronic library, which opens access to electronic resources of other libraries of the world. Approximately 800 scientists and professionals are working in the University, 87 % of which are awarded scientific degrees (Ph.D. and D.Sc. ), including 49 Academicians and Corresponding Members of Russian Academy of Science. Since 1978 the University has been training specialists for foreign countries. The University graduates work in 46 countries. More than 20,000 students, including 300 foreign citizens, are studying at the University. The University offers a wide range of academic programs leading to bachelor's, master's, professional and doctoral (Ph.D. and D.Sc.) degrees. There are 6 Dissertation Councils at the University. faculty of radiophysics, electronics and medical engineering (journalism; radiophysics and electronics; bioengineering and medical apparatuses and systems; radio engineering; design and technology of radio electronic facilities; radio communication, broadcasting and television; design and technology of electronic and computer facilities, etc). faculty of informatics and applied mathematics (applied mathematics and informatics; information systems in engineering and technologies; laser engineering and laser technologies; complex protection of information objects; means of communication with movable objects; computers, computer complexes, systems and networks; applied informatics in economics, etc). mechanical technological faculty (mechatronics; information systems in engineering and technologies (systems of computer graphics and multimedia technology); foundry of ferrous and non-ferrous metals; machine building technologies; metalcutting machines and tools, etc). faculty of automobile transport (standardization and certification; servicing and maintenance of transport and technological vehicles and equipment in automobile transport; quality control; metrology and metrology support, etc). faculty of chemistry and ecology (chemistry; plastics and elastomers processing technology; environment protection and rational use of natural resources; biology; ecology, etc). faculty of architecture and civil engineering (architecture; industrial and civil construction engineering; town planning and economy; automobile roads and airports; estimation and real estate management, etc). faculty of humanities (jurisprudence; sociology; religion science; psychology; culture science; history; museology). faculty of economics (company management; marketing; economics and management in construction; economics and management at municipal companies; economics and management in tourism and hotel business). faculty of small and medium business (economics; management). 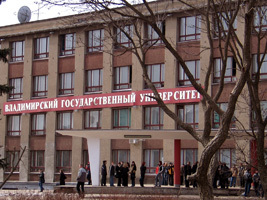 The Department of Russian as a Foreign Language has been a part of the University since 1981. It offers 10 months Preparatory Course (from September to July). The Course is available starting September 1st, October 1st and includes the following programs: the Russian language course, Mathematics, Physics, Chemistry and other subjects according to the program of their future specialities. Students who have successfully completed the course and passed proficiency examinations receive the certificate which gives the right to be admitted to Vladimir State University. The Department of Russian as a Foreign Language is authorized to take exams on Russian as a foreign language in the frameworks of the state test system. On passing these tests foreign citizens get the certificates of the Ministry of education and science of the Russian Federation which permit them enter any Russian University. The Department of Russian as a Foreign Language offers Pre-Masters Program for those who wish to follow a Post-Graduate degree, which is for one academic year. At the Department of Russian as a Foreign Language the foreign citizens may take the Russian language courses, as well as individual programs of study ranging from 1 month to 2 years. We also offer an interesting cultural program throughout these courses. Visit to the ancient Russian city of Suzdal, sightseeing in the ancient parts of Vladimir, visits to museums, art galleries and theatre performances are included. The university disposes of the sports complex with its swimming pool, gyms, fitness- center and other sporting halls. The Association of foreign students established in Vladimir State University has got close contacts with All-Russian Association. Different cultural events including music programs, competitions and festivals are held at the Cultural Center. Foreign students are accommodated at the dormitories which are situated on the territory of the University campus. The hostels offer comfortable living conditions. Health provision is available at the University. Authors: Kuzmin, L.L. & Gagarin, V.G. by postal or electronic mail. I haven't found the mail of the library, so I write to you. Please, could you inform me about the possibility of reproduction, format, method of payment, and so on? We prefer pay by IFLA vouchers if that were possible. Copies are asked exclusively for private copy, cultural or scientific research, not for commercial use.